As designers we spend our days helping people figure out what their style is and what works for them. Since we are “the designers who care” we walk the thin line between pushing our clients to try new things and imposing our style on them. Along this journey we try to figure out what our personal style is, most likely a mix of styles. I have somewhat figured out my look, it is basically eclectic-antique-comfortable with personal touches and lots blue and green. So here are some images that have helped me come to this conclusion and may help others find their way! What is your style? Although I love color, the soothing feel of this tone on tone bedroom is very appealing to me. I love the mix of woods, the simple side tables that are similar but different and the carved bench. My favorite of course is the jaw dropping canopy hung from the ceiling! This space speaks to my traditional heart! The teal sofa, purple lamp and funky stripe on the chairs keep the room from being stuffy or boring. Now this is an interesting dining room, interesting in a good way! The color palette seems to have come from the magnificent light fixture. The once traditional chairs have been brought to life with red paint and a graphic black and white print, the mirrors also got a fresh face with some yellow paint. 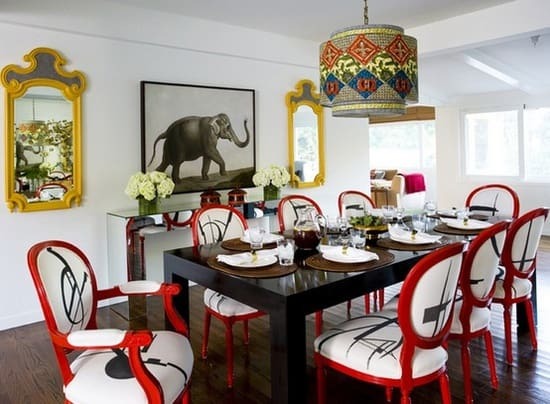 In combination with the elephant print and mirrored console, this room is wonderfully whimsical! This kitchen has been in my life for many years, I am unsure where I originally saw it but I tore the page out of a magazine and I still have it! The wall and cabinet color is perfect to me (Tiffany blue perhaps?). In many kitchens or with another color this may not work , but here it is executed impeccably. The desk is what I love most about this work space! The white walls and floor make the perfectly styled desk stand out. The tall wooden lamp is fun and unexpected. A gallery wall, a claw foot tub, a chandelier and a zebra rug, what else do you need in a bathroom? Clothes of course! In my opinion this space would be an oasis to get ready in! This playroom would be fun for adults and children alike. The tepee and elephant could make for hours of fun for the imagination! With a cozy rug and plenty of storage this space is ideal. If you are unsure of your personal style, Nandina Home & Design is happy to help you figure it out. We love going through as many options as necessary to find that perfect piece that makes a client happier than they ever imagined. Whether you’re traditional, modern, transitional or eclectic, our designers create gorgeous spaces to meet every need, budget and personal style.